A temporary trestle allowed crane access for pile installation, starting from each end of the future bridge’s footprint and meeting in the middle. Visible in the background is the Surf City swing-span bridge that will be decommissioned after the new bridge is opened. This also appeared in Pile Buck and Water Online. 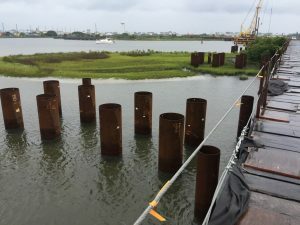 The North Carolina Department of Transportation (NCDOT) is building a new, high-rise bridge to span the Intracoastal Waterway in Surf City, replacing a 1950s era swing-span bridge that has come to the end of its efficient service life in Pender County. Buried under the waters of the new Topsail Island Bridge is AMERICAN SpiralWeld Pipe. While AMERICAN’s spiral-welded steel pipe is most often used in water delivery, it also excels as drilled shaft casing pipe used in the formation of cast-in-place concrete piles. The AMERICAN SpiralWeld 48- and 60-inch pipes, or casings, were vibrated into the earth to a point approximately 15 feet below the mudline. 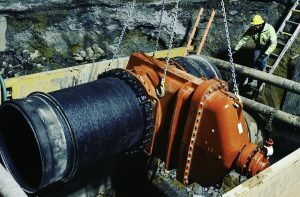 Next, an auger inserted into each casing drilled down an additional 60 to 80 feet to bedrock so the shafts could be filled with rebar and concrete to form the cast-in-place pile. The piles will support the bridge foundation. AMERICAN’s facility in Columbia, South Carolina, manufactured 111 pieces of 48-inch carbon steel pipe (4,332 feet total) and 69 pieces of 60-inch carbon steel pipe (2,343 feet) for the project. These totals included test casings. The structural casings were cut to custom lengths ranging from 30 to 50 feet. They were manufactured to ASTM Specification A252 Grade 3, to be used in a drilled piers, deep-foundation system that will support the bridge’s 28 bents or visible support columns. The distributor was Triad Piling Products in Birmingham, Alabama, part of Triad Metals International. The primary installation contractor for this $54 million project is Balfour Beatty Infrastructure, Inc. The AMERICAN SpiralWeld structural casings – 176 of them – have already been installed in this project that places a high priority on protecting the local ecosystem and wetlands. In fact, there is an annual, in-water construction moratorium between April 1 and September 30 due to fish spawning season. During this time, no pile driving or extracting operations could occur on the bridge replacement project. Construction began in September 2016 following several years of project studies and planning. 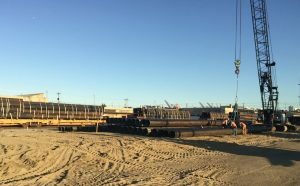 Casing pipe shipments began in early January 2017 and continued through much of March, timed to the installation schedule. Balfour Beatty Infrastructure, Inc., worked double shifts six days a week installing the 48-inch and 60-inch casings. They performed the work from a temporary trestle built starting at each end of where the new bridge will be and meeting in the middle as the casing installation progressed. 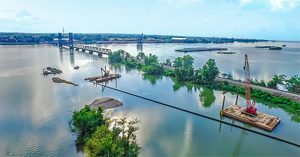 Each casing, and each smaller diameter pile supporting the trestle, had to be vibrated into the earth before the April 1 deadline, which Balfour Beatty met, according to a May 2017 article on Port City Daily. Coastal bridge installations requiring temporary trestles for access is a Balfour Beatty specialty. Project completion is scheduled for November 2020. 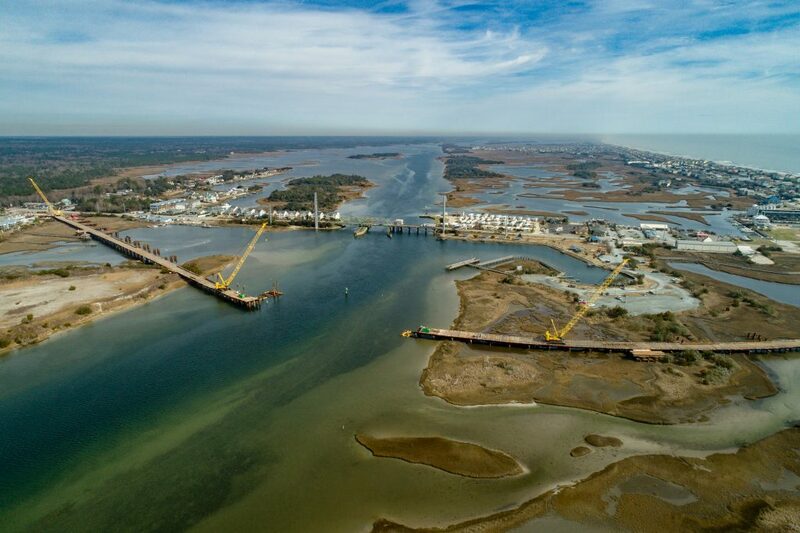 When completed, the bridge will span almost 3,800 feet and will reach a 65-foot, high-tide clearance as it sweeps from the mainland across the channel to Topsail Island. The bridge will have two traffic lanes, two bicycle lanes and a barrier-protected multi-use path. During emergencies such as hurricanes, the bridge can be converted to three travel lanes – two exiting the island and one for emergency vehicles going to the island.